Wicksteed Park Model Boat Club restarted as a club in February 2005, however there has been a model boat club based at Wicksteed Park since the early 1920s. Originally called ‘Wicksteed Model Yacht & Power Boat Club the boats have changed from vane yachts and pole racing I/C powered boats to scale and power boats with Marblehead racing yachts. The original hard standings for the yachts and the pole support are still visible in the lake after 90 years. The club has over 60 members each with their own taste in model boats varying from the Fiesta yachts to 8ft long scale warships. For the club members and regular visitors who know the site we have placed some quick links below to pages that are used most relating to outside events that the club attends. They will be left here for a short while after the event and then transferred to the recent events section of the site. The club Christmas Dinner was brilliantly organised by Janet Beard on the 17th December and was attended by almost half of the current club membership and family. The evening was full of fun and festive spirit with many new members joining in with the meal for the first time. The club dinner has always been the time and place to award the club trophies (in fact after some recent research I find this is a club tradition since 1928!) and we had our former chairman's wife awarding her husband's memorial shield to Gordon Gaze for his beautifully finished Tamar class Lifeboat which was voted club favourite. Nick Brown was awarded second place with his Train Ferry, and Andrew Belling in third with another lifeboat. The Maureen Millers Cup is given to the club member whose model is displayed at the Warwick Show is the 'Chairman's Favourite'. This was promptly awarded to Bill Traynor-Keanes for his fully working model of a Type VII U-boat by Janet Beard. And finally Pam Baker presented the Victoria Cup to Nick Brown, who collected it on behalf of Tony Newstead who couldn't be present on the evening. We displayed at the International Model Boat Show at the Warwickshire Events Centre near Leamington Spa. Once again we had an excellent position close the display pool which allowed some us to show the models on the water. The club stand showed our wide interest in different types of model boating: there was a huge display of WW1 era warships surrounding Ron Kingdon's monstrous sized HMS Invincible G3 Battlecruiser (a what-if project from 1921), a new collection of vintage model boats from our childhoods presented by Roger Clements, and Bill Trayner-Keanes and Alan Burgess took the corner of the stand with the most amount of submarines- all working and submerging! Nigel Marriott bought his tug and Glynn Guest aircraft carrier with scratch-built Sea-Fury fighter aircraft on deck. New members also displayed beautifully built lifeboats and yachts which finished off the stand fantastically. Keith Carey was a Wicksteed Park MBC Chairman but unfortunately passed away just two years into his tenure as Club Chairman. We remember him every year by hosting the Keith Carey Memorial Shield which is awarded to the club member whose model boat is voted favourite by the club. The Shield is presented to the lucky recipient by Maureen Carey at the club's Christmas Dinner. The Sunday morning in September had fantastic weather with good sunshine and the predicted rain staying away. Over sixteen individuals entered their models into the competition with several new members displaying some excellent quality models. Many thanks to Roger Kirbyshire for organising the day and counting up the results to find out who our lucky winners are. In August 2017 the club not only lost a member but a very good friend to us all, Bob Baker sadly passed away. We will remember him for his humour, his honesty, and his brilliant work as a model boat builder. A proud member of the RAF Regiment, he was always available to help/assist/man the club at any event, his skills on the club's bring & buy stand was amazing bringing in far more than what was expected. His first modelling love was yachts and in 2012 Bob rescued two vintage 10R yachts from a scrap heap- it was discovered that the two models, Undine and Sagitta were of historical importance to the club as they were former registered models at Wicksteed Park in 1936! They were restored to their former glory and sailed at the lake. After his passing, Pam Baker asked the club committee to meet with her and it was decided that the 'Bob Baker Memorial Cup' would be created. Called 'The Victoria Cup' after his favourite model yacht, the cup would be awarded for an excellent standard of modelling work and be presented by Pam at the Christmas Dinner. An excellent way of remembering this remarkable modeller. The 2017 recipient of the Victoria Cup was John Pates with his lovely model of Earnshaw, a small coastal steamer that is still in use today. Based on plans in the Model Boats Magazine, John finished off his model with almost 50 figures and is well deserving in this endeavour. The Cup was awarded to John at the Christmas Dinner by Pam Baker. 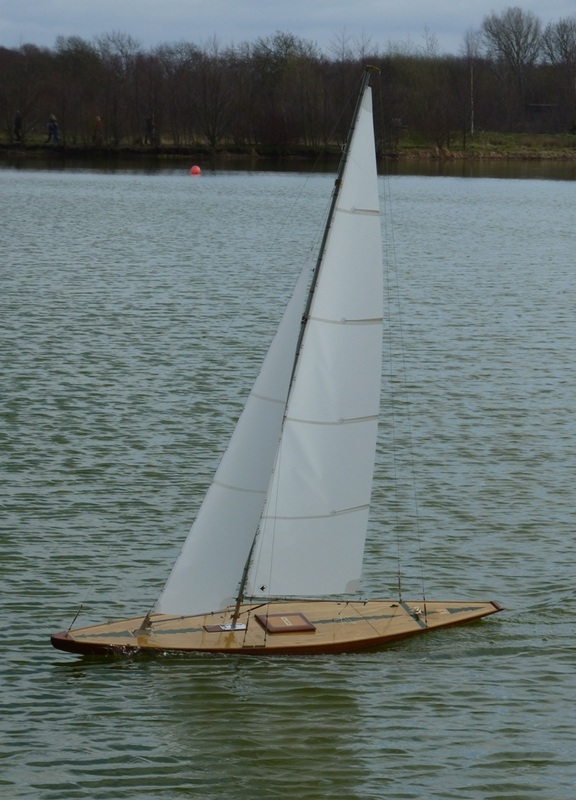 The 2018 winner of the Victoria Cup was Tony Newstead with his 100% scratch-built model of HMS Welland. The model is a pre-WW1 destroyer named after one of the many rivers in Britain hence the class designation 'River class'. Tony was unable to collect the cup from Pam at the Christmas Dinner so was accepted on his behalf by Nick Brown. This year we moved the club gazebo into a more prominent position and a new club sign at the gate and, wow, what a difference! With an unprecedented number of park visitors coming down to the model boat lake we gained three new club members and most certainly impressed the children with the big battleships. With big gun monitors, WW1 and WW2 battleships down to the little support craft that get forgotten about we had a wide variety of warships on show. To support the organisers we had some RAF boats on show from Pinnaces to Armoured Target Boats showing the truly different marine craft operated to the Royal Navy. After a weekend of predicted turbulent weather warnings around Kettering the mood was understandably worrying but the sun gods must have smiled on us as the thunderstorms and rain never materialised giving us the best weather the event has ever had!!! A fantastic weekend of sun and light winds gave us the perfect sailing weather to allow warships and yachts to sail together with ease. Some new clubs made a welcome appearance to the show, Cambridge MBC, Welwyn Garden City MBC, and the newly created Hemel Hempstead MBC. All together there were ten clubs exhibiting and Mr Ron Dean of Dean's Marine showing his latest models and actually getting his boats wet this year! Carl and Flo of Linkspan Models were on their way to Kettering as their RV decided not have an EGR valve anymore- you were missed- but look forward to seeing you both next year. We had visitors from Belgium and South Africa this year hearing about the event over the Mayhem forum proving it is truly a global show. From the Wicksteed Park club stand we would like to thank Jan Beard for setting up and running the Tombola this year with the most successful takings in club history. On behalf of Jan we would like to thank Nicki Horrell and Barbara Crisp in helping and supporting Jan over the weekend. Well done Ladies. Once again we had a fantastic position at the Warwick Exhibition Centre hosted by Meridienne Exhibitions. The club stand was split into four areas of interest supported by the club: yachts, warships, work/pleasure boats, and vintage. A brilliant three days of model boating fun. The last Friday of June became our first evening night sail for the year, unfortunately the weather had other plans! The night started at 6pm and a good number of models took to the water of so many varying types. Yachts made the most of the light winds whilst the launches made waves of their own. A couple of warships made the evening complete but the rain interrupted play at 8:30pm so it was decided to return to home ports for the remaining part of the night. Many thanks to Jan, Nicki, and Maureen for all the bacon sandwiches and coffee, and some beautifully made cakes. Many thanks to Alan for supplying the photographs for this report. The slide show below has the combined photos from three evening/night sails so far. This year we had a display are inside the main arena to incorporate some static models into a historic theme of 'The Battle of Denmark Strait' or more famously Hood vs Bismarck. With the static display showing the main protagonists of the battle, in the main display tent by the lake side we had the bigger 1/96 scale models of HMS Rodney and HMS King George V built by Ron and Sheila Kingdon. Also on display were the WW1 section by Nick Brown and Tony Newstead, whilst Steve Brown showed his rather large submarine HMS X-1 and the even bigger gunboat HMS Gnat. Dennys Warren showed some of the smaller WW2 vessels and Russell Tonkin showed his tiny RAF Pinnace and Royal Navy TBD. A very enjoyable event that we look forward to next year. It hardly feels like a year since the 2016 event and this year was another brilliant mix of fun, model boating, and relatively good weather!!! With battle fleets of WW1 and WW2 battleships, to ferries of the North Sea variety we had an amazing selection of model boats on the lake. This year we had the re-introduction of the Tombola and we would like to thank to those who donated, and to Jan, Nicki, and Nigel for organising and running the table. We returned once again to display at the bi-yearly model exhibition held at Windmill Ave Primary School all in the name of charity. A thoroughly enjoyable weekend with over thirty club boats on display. Many thanks to all who helped. Festive jollies and hijinks at the Stirrup Cup and the winners of the Keith Carey Memorial Shield and Maureen Millers Memorial Cup are awarded. Click on the links below for the report and pictures of the Mayhem weekend and the brilliant summer sun! In July 2015 the club lost a very much loved secretary who helped turn the club in to the vibrant and exciting membership we have today. Maureen become the club secretary in 2012/3 and became known as the 'Black Widow' as she could persuade anyone to become interested in model boats and join the club, expanding the membership to 86 at its peak! With Joan and Jan they came to be known as the 'witches coven' and were often creating exotic cakes and biscuits for the club members to try on the Sunday club mornings. Her piste de resistance was the Mayhem tombola stand where she managed to create competition between the Mayhemer's for the top prizes, each year the money raised was exceeded. Well loved and gave so much to club, we miss you Maureen. Paul Millers donated a cup for her recognition as a outstanding club member and wife, and asked the club chairman to organise a competition for the club membership to allow the cup to be awarded. The cup is awarded for the Chairman's Choice of his favourite boat on the club stand at Warwick. The cup is presented by Paul to the winner at the Club's Christmas Dinner. For the latest notes and reminders from our last club meeting, as well as from previous meetings please click below. Clyde Puffer, owned and built by Clive Beard with one of his own design smoke generators installed and working well. 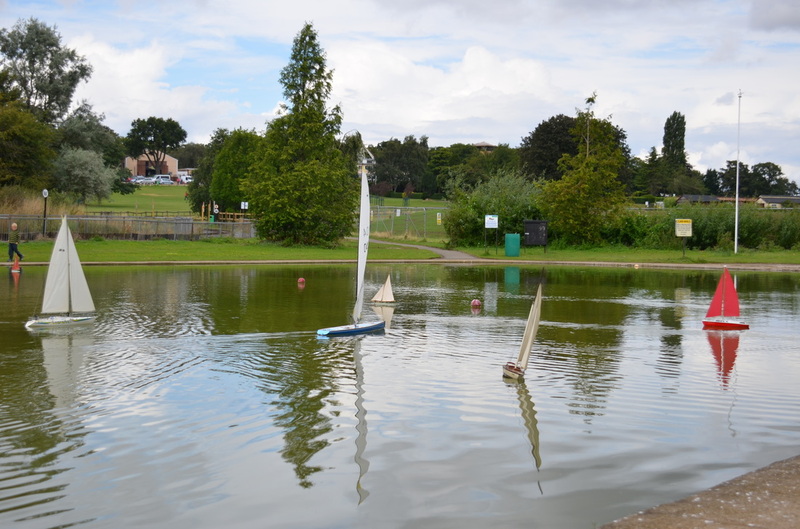 What the Wicksteed Park lake's all about, the picture was taken mid August 2014, a member of the public sailing an RC yacht with his two grand children sailing their pond yachts and three club members also under sail and no incidents, a few near misses but no incidents! If the Grandad would get in touch through the 'contact page' I have more pictures that I could send to him.